CONCORD, N.C. – Perhaps Martin Truex Jr. summed up the status of NASCAR’s Contender Round the best when he said Bank of America 500 winner Joey Logano would be the only one sleeping for the next two weeks. With two 1.5-mile tracks and the 2.66-mile Talladega facility comprising The Chase’s second round, the drivers battling for the championship were adamant that their performance at Charlotte Motor Speedway was critical. Just as important for Logano, however, is the fact that with his victory he defeated defending series champion Harvick by 0.703 second. Harvick has been strong the entire season, posting three victories, 20 top-five and 24 top-10 finishes with only one DNF along the way. He dominated the Dover and New Hampshire Chase races, emerging victorious at Dover but running out of fuel with less than five laps remaining at New Hampshire. 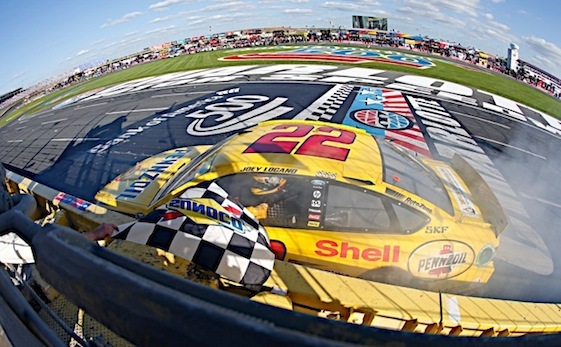 No doubt, however, Logano’s victory Sunday sent a message as he led four times for 227 of the race’s 334 laps. “When you can beat the 4 car (Harvick) any day, any time, that’s a big deal for us and I think it was good that we could at least be on a level playing field with him today,” team owner Roger Penske said. Harvick, who finished second, actually failed to lead a lap in the event that had nine caution flags for 44 laps. Heading to Kansas, Logano leads Harvick by six points, while third-place finisher Truex trails by seven. “We’re just going to Kansas and keep our head down and grind away,” Harvick said. Logano said that just because his team defeated Harvick at Charlotte doesn’t mean the target has shifted to his back. Crew chief Todd Gordon said the car Logano drove to victory Sunday probably won’t be used the rest of the year. Due to the rain delay that moved the Charlotte race from Saturday night to Sunday afternoon, it was the first Bank of America 500 to be held during the day since 2002. And it struck a dismal tone for three Chase contenders – Matt Kenseth, Dale Earnhardt Jr. and Kyle Busch. Kenseth led twice for 72 laps before his race took a downward turn. It began when a miscue on a pit stop left him back in the middle of the field on a restart. Then a collision with Ryan Newman damaged his car when the two brushed the wall. That led to more problems on Kenseth’s Toyota until he eventually slammed into the third-turn wall on lap 240. His elimination from the race left him 42nd in the rundown and 12th in points, 45 behind Logano. Earnhardt Jr.’s bid to advance to the Eliminator Round also took a severe hit due to his Chevrolet’s several encounters with the track’s wall. He finished 28th and found himself mired in 11th in the standings, 32 points back. Busch’s misfortunes occurred during the eighth caution period on lap 195 when he and Kyle Larson changed their minds about pitting simultaneously. Busch decided to turn back onto the track at the pit road entrance as Larson elected to turn onto pit road and the two collided. Busch had to settle for a 20th-place finish. He’s now 10th in the standings, 23 points behind Logano. Newman’s 15th-place finish left him ninth in the standings, just six points below the cutoff mark.